The top two volleyball teams in the Class 3A Sunset League have a spirited rivalry, and after Pahrump Valley defeated Mojave in five sets on Sept. 13 in North Las Vegas, the Rattlers figured to be fired up for the rematch. Horace Langford Jr./Pahrump Valley Times Sophomore Nicky Velazquez recorded 16 kills Wednesday night during Pahrump Valley's 3-2 loss to Mojave in Pahrump. 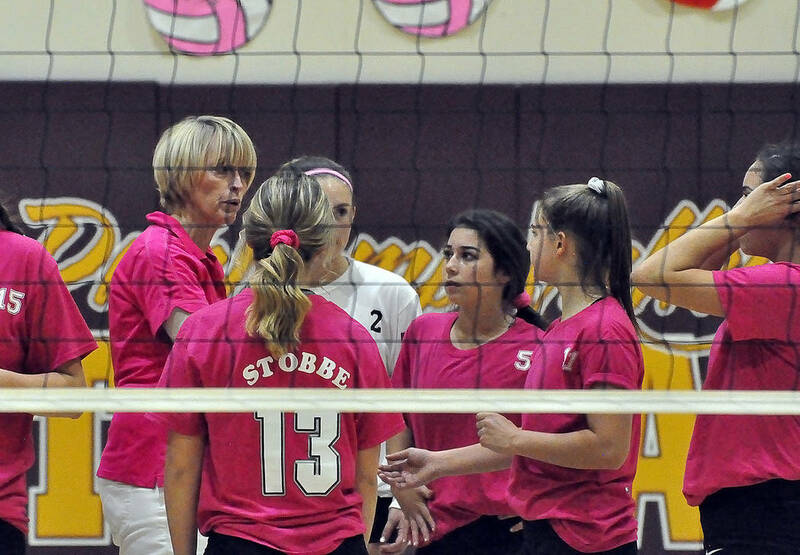 Horace Langford Jr./Pahrump Valley Times Pahrump Valley volleyball coach Jill Harris talks to her team during a timeout Wednesday against Mojave in Pahrump. And they were, as Chania Scott recorded 22 kills Wednesday night in Mojave’s 25-19, 25-23, 20-25, 27-29, 15-12 victory over the Trojans in Pahrump. Nicky Velazquez and Kate Daffer each finished with 16 kills for Pahrump Valley (13-10, 8-1 Sunset). Mojave is 22-7 overall, 8-1 in the league. The Rattlers have scored 16 more points than the Trojans during the two matches between the teams. It is possible that either of them could lose to another league opponent, but it’s not likely. The only other team over .500 in league play is Western, which is 5-15 overall and was swept by both of the top two teams in their first meetings. Although the Rattlers avenged their earlier loss to the Trojans, Harris saw good things from some of her players. Some holding together was needed after the Trojans dropped the first two sets. The second was especially frustrating, as the Trojans fell behind 14-6 before rallying, coming within two points four times but not cutting the deficit to one until it was 24-23. But a kill attempt found nothing but net, and the Rattlers had a 2-0 lead. The biggest problem for the Trojans was Scott, who at times was a dominant presence in the middle. Things picked up in the third set, when it was the Rattlers who kept clawing from behind. The Trojans took an 8-2 lead, but it was a battle from there, tied at 11-11, 12-12, 15-15, 19-19 and 20-20. But Pahrump Valley never surrendered the lead, and when Velazquez gently tapped over an easy kill, the Trojans had a 25-20 win. The fourth set featured a wild ending, as the Rattlers fought off three set points before taking a 25-24 lead. But they couldn’t put it away. Each team committed a double hit violation on set point after that, but two consecutive errors by Mojave gave Pahrump Valley a 29-27 win and an even match. 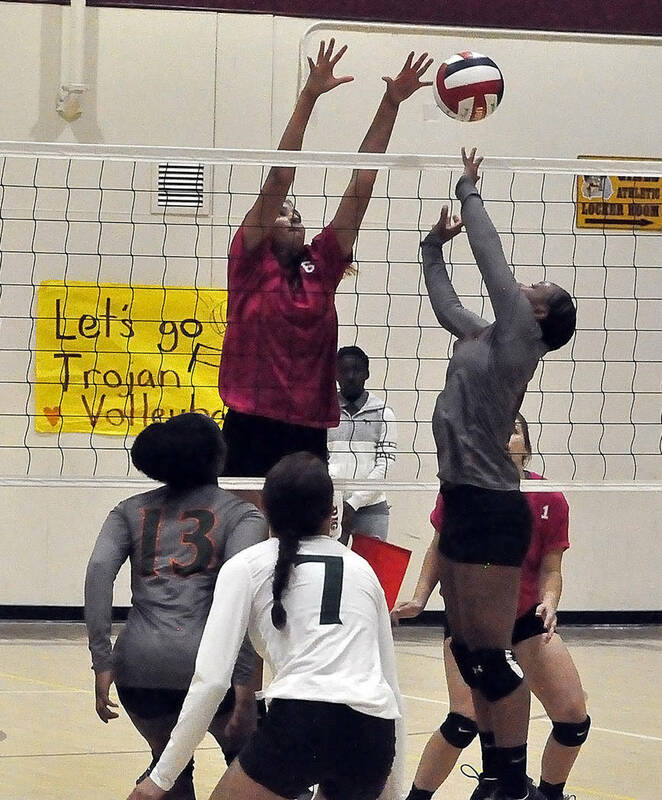 The fifth set was largely anti-climactic, as Mojave held a slim lead throughout. They never pulled away but never allowed the Trojans to get even, winning 15-12 to move into a first-place tie, which, as Harris explained, puts them ahead of the Trojans on the tiebreaker. Jackie Stobbe finished with 24 assists for Pahrump Valley, and Wombaker added 12. The Trojans go outside the Sunset today for a 6 p.m. match at Cheyenne, then start a season-ending three-game stretch of league matches Tuesday at Somerset-Losee.